Super smooth ink for effortless writing. 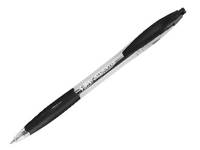 Retractable ballpen with grip for a soft cushioned grip to ease writing fatigue. Nickel Silver point ensures faultless distribution of ink. Colour - Black. Approx Dimensions (CM): D15.2 W7.5 H3.4. Approx Weight (KG):0.1171.